Lay’s Do Us A Flavor contest to determine the newest Lay’s flavor is back for its second year. From a pool of more than 14 million submissions, Frito-Lay’s finalists for the competition are: Cheddar Bacon Mac & Cheese, Mango Salsa, Wasabi Ginger, and Cappuccino. It’s a total grab-bag of flavor profiles, but then again, so was last year’s group: Chicken & Waffles, Sriracha and Cheesy Garlic Bread. This year’s Do Us A Flavor chips will be on shelves from July 28 through October 18, during which time chip-lovers can vote for their favorite flavor. Try the Bacon Mac n Cheese Chips now at the nearest Gator Vending Snack Machine Now. 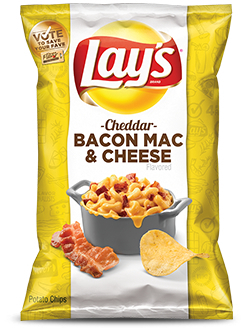 The winner will not only become the next Lay’s flavor, but the person who submitted the idea for the flavor will win $1 million.